Nuts are nature's way of showing us that good things come in small packages. These bite-size nutritional powerhouses are packed with heart-healthy fats, protein, vitamins, and minerals. Here's a look at the pros and cons of different nuts, as well as the best and worst products on supermarket shelves today. Of course, you can get too much of these good things — nuts are high in fat and calories, so while a handful can hold you over until dinner, a few more handfuls can ruin your appetite altogether. And, although nuts are a healthy choice by themselves, they'll quickly become detrimental to any diet when paired with sugary or salty toppings or mixes. All nuts are about equal in terms of calories per ounce, and in moderation, are all healthy additions to any diet. "Their mix of omega-3 fatty acids, protein, and fiber will help you feel full and suppress your appetite," says Judy Caplan, RD, a spokesperson for the Academy of Nutrition and Dietetics. Ounce for ounce, macadamia nuts (10 to 12 nuts: 2 grams protein, 21 grams fat) and pecans (18 to 20 halves: 3 grams protein, 20 grams fat) have the most calories — 200 each — along with the lowest amounts of protein and the highest amounts of fats. However, they're still good nuts: The difference between these and the lowest calorie nuts is only 40 calories an ounce. 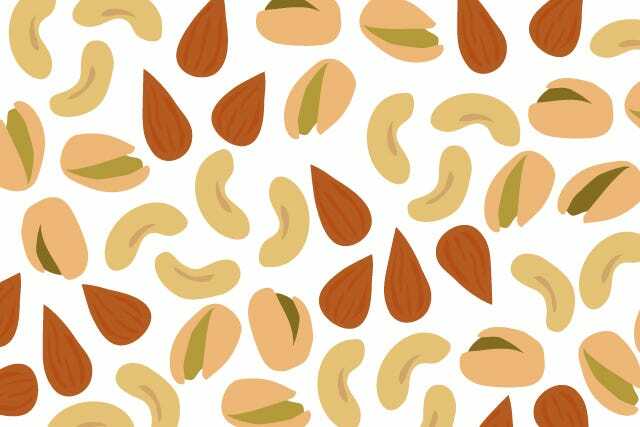 As long as you're practicing proper portion control and not downing handfuls at a time, says Caplan, any kind of raw, plain nut will give you a good dose of healthy fats and nutrients. Technically legumes but generally referred to as nuts, peanuts are high in folate — a mineral essential for brain development that may protect against cognitive decline. It also makes peanuts a great choice for vegetarians, who can come up short on folate, and pregnant women, who need folate to protect their unborn babies from birth defects, says Caplan. Like most other nuts, peanuts are also full of brain-boosting healthy fats and vitamin E, as well. One ounce of peanuts (about 28 unshelled nuts) contains about 170 calories, 7 grams protein, and 14 grams fat. Creamy Brazil nuts are packed with selenium, a mineral that may protect against prostate cancer and other diseases. Just one nut contains more than a day's worth, so eat these sparingly. Recent research has hinted that too much selenium may be linked to type 2 diabetes risk. One ounce of Brazil nuts (6 nuts) contains about 190 calories, 19 grams fat, and 4 grams protein. Pecans are also good for men's health. They're loaded with beta-sitosterol, a plant steroid that may help relieve symptoms of benign prostatic hyperplasia (BPH), or enlarged prostate. One ounce of pecans (18 to 20 halves) contains about 200 calories, 21 grams fat, and 3 grams protein. Relatively low in calories, almonds have more calcium than any other nut, making them a great food for overall health. Plus, they are rich in fiber and vitamin E, an antioxidant that helps fight dangerous inflammation and possibly health conditions such as lung cancer and age-related cognitive decline. Because they're so versatile, almonds are often a favorite among nut eaters. You can buy them raw, toasted, slivered, or coated with a variety of fun flavors. Because nuts are so high in calories (and so tasty, to boot! ), it's important to practice portion control when eating them as a snack. We love Blue Diamond Almonds 100-calorie snack packs, available in six flavors. Want more variety? Pick up Planters Nutrition Wholesome Nut Mix on-the-go packs, each containing a 200-calorie mix of cashews, almonds, and macadamia nuts. We're all for buying in bulk to save money and packaging, but it's important not to snack straight from the box (or in this case, the giant tub) when a craving hits. Beer Nuts' "original" formula — peanuts coated with a sweet and salty glaze — aren't a bad choice themselves (170 calories, 14 grams fat, and 2 grams sugar per ounce), but if you're munching on them at a party or during a "long day of game watching," as the company's website suggests, you'll likely be eating more than the recommended serving size. Not to mention, the Party Mix variety also includes M&Ms and sugary, yogurt-covered raisins, for an extra calorie boost. A better bet is Beer Nuts' Original Teaser Peanut Sized bags, each containing just half an ounce of nuts. Rather than hiding your nuts under a thick layer of sugary chocolate candy — think Jordan almonds or peanut M&Ms — keep it simple with Emerald's Cocoa Roast Almonds. These nuts are lightly dusted with cocoa powder and sweetened with Sucralose, and have 150 calories, 13 grams fat, and 1 gram of sugar per ounce. 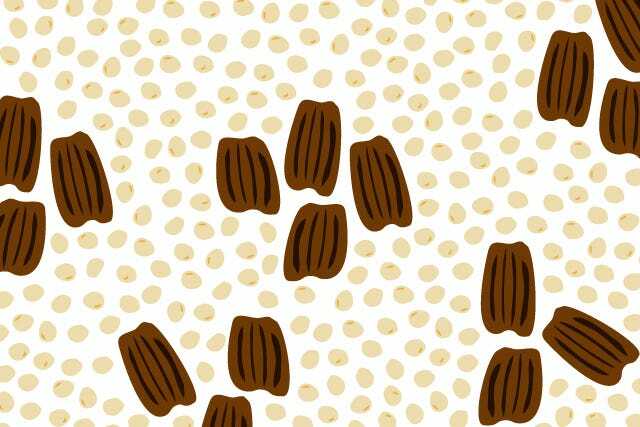 We'd give you a "worst" nuts for chocolate lovers, but the possibilities are practically endless. Just think of it this way, says Caplan — anything that's more chocolate than nut really should be considered candy, not as a way to get your daily quota of healthy fats. Want something sweet and satisfying but without the extra calories and high-fructose corn syrup? Look no further than Sahale Snacks glazed nuts, in flavors like Almonds with Cranberries, Honey, and Sea Salt (160 calories, 11 grams fat, 5 grams protein per ounce) or Cashews with Pomegranate and Vanilla (150 calories, 10 grams fat, 4 grams protein per ounce). They're sweetened with organic cane juice and tapioca syrup, and each contains only 6 grams of sugar per ounce. Just be careful not to eat the whole bag. Just because something has nuts in it doesn't make it good for you, says Caplan. "Don't justify eating a Snickers because it's got peanuts in it." Anything coated with or tucked inside layers of sugar, toffee, chocolate, or ice cream isn't going to give you much nutritional benefit, and the calories can quickly add up, she says. It's not just candy, though. Beware of seemingly healthful varieties, like Planters Sweet 'N Crunchy Peanuts. Although they still have just 140 calories and 8 grams fat per ounce, the second and third ingredients after peanuts are sugar and butter. In fact, one ounce contains 13 grams of sugar (in just a 28-gram serving size). Considering peanuts only have about 2 grams of sugar naturally, that's 11 grams of added sugar in just one handful, out of a recommended 25 for the whole day! If you don't have high blood pressure or haven't been warned away from salt by your doctor for other reasons, a handful or two of salted nuts a day won't hurt you, says Caplan. Nuts are, of course, available unsalted. But, to satisfy a salty craving without going overboard, look for in-between varieties like Planters Lightly Salted peanuts, almonds, and cashews (45-55 mg sodium), or Wonderful Pistachios Lightly Salted (80 mg). Check ingredient labels, too. Some brands, like Back to Nature Salted Almonds (75 mg sodium), contain less salt than others. If you're watching your sodium intake, watch out for hot and spicy or barbecue flavors too. Kar's Nuts Blazin' Hot Peanuts, for example, contain 370 mg of sodium per ounce (along with 160 calories and 14 grams fat) — a whopping 15% of your daily recommended value, in just one handful! Beware boiled peanuts, as well. This Southern treat is made by soaking fresh, raw peanuts, in their shells, in a salty brine. Sodium amounts will vary based on the exact preparation, but Margaret Holmes Peanut Patch boiled peanuts, for example, contain 390 mg per ounce. Trail mix is available in countless varieties and from countless brands. "Look for trail mix with raw nuts," suggests Caplan. "Or if the nuts are roasted, look for the words 'dry roasted' rather than 'oil roasted.'" Nuts pair great with fruit, seeds, and perhaps even a little dark chocolate, Caplan adds; just pay attention to the calorie count and serving size. We love Eden Foods' "All Mixed Up" blend (160 calories, 12 grams fat, 8 grams protein per ounce) of organic almonds, pumpkin seeds, and dried tart cherries. If you're more of a granola guy or gal, treat yourself to a quarter cup of Bear Naked's Banana Nut mix (140 calories, 7 grams fat, 3 grams protein) with almonds and walnuts. High-calorie trail mix is fine when you've got a long hike ahead of you, but too often we eat these store-bought blends while sitting at our desks or driving in our cars. Don't make that mistake with Planter's Energy Go-Packs, a 1.5-ounce mix of nuts, semisweet chocolate, oil roasted soynuts, and sesame seeds. With 250 calories and 20 grams of fat a pop, they fall slightly above our healthy snacking guidelines. Also check labels for sky-high sugar contents. Some trail mixes — especially those with raisins, dried cranberries, and/or candy-covered chocolate pieces — can contain up to 18 grams of sugar per serving. 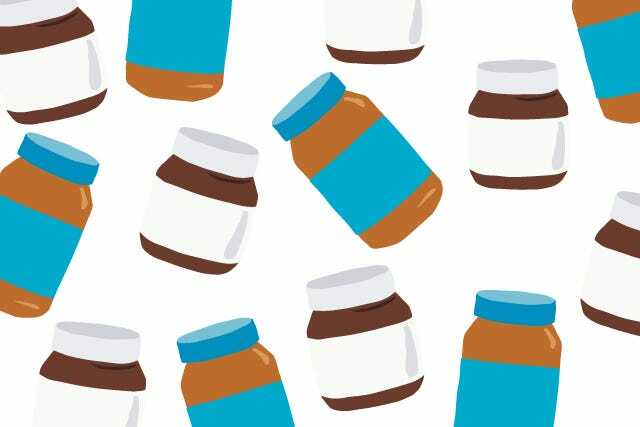 When choosing a nut butter, look for spreads with the fewest ingredients possible. Just nuts (and salt, if you want). Arrowhead Mills Organic Peanut Butter, for example, contains 100% dry-roasted peanuts, and has 190 calories, 17 grams fat, and 8 grams protein per 2 tbsp serving. (We also like their creamy cashew and almond butters, which do contain some natural canola oil.) Keep natural peanut butter in the fridge, advises Caplan, to keep it from going rancid and to prevent oily separation. Major brands have eliminated trans fats from their nut butters, but most still contain hydrogenated oils (high in saturated fat) to increase spreadability and prevent separation. Some "natural" product lines swap hydrogenated oils for palm oil, also high in saturated fat. Skippy Natural with Honey, for example, contains 200 calories, 16 grams fat (3.5 grams saturated), and 5 grams sugar per 2-tablespoon serving. Nutella's creamy chocolate-hazelnut combo is terrific for an occasional treat — but it's hardly part of a "balanced breakfast," as its commercials say. Two tablespoons contain just 200 calories, yes, but 21 grams of sugar. In fact, sugar and palm oil are the product's first ingredients, even before hazelnuts. Now you know all about which nuts are good for what — but to get the most health benefits, it's also important to pay attention to how you eat them. "Nuts are a great thing to eat when you're having a carbohydrate like fruit or juice, because it helps slow down digestion and the breakdown of sugar," says Caplan. A few winning nut-and-carb combos — sprinkle them on salads, add them to low- or nonfat yogurt, or spread nut butter on slices of apple or pear. On the go? Pick up a 150-calorie pack of Earthbound Farms Dippin' Doubles Apples & Peanut Butter (11 grams fat, 5 grams protein). So which is the healthiest nut overall? A 2004 review in the Harvard Medical School Family Health Guide tackled this tough question. Luckily, they concluded, we don't have to pick just one. Mixed nuts, ideally raw and unsalted, provide the best variety of nutrients and antioxidants.